Saudi Arabia's maritime sector is gearing up to make the kingdom a regional logistics hub and drive forward economic diversification and job opportunities, highlighted leading experts and officials at the recently concluded Saudi Maritime Congress, held in Riyadh. Engineer Saad Bin Abdulaziz Alkhalb, president, Saudi Ports Authority (Mawani), said: “This event takes place at a time of significant change within the kingdom’s logistic and maritime infrastructure. 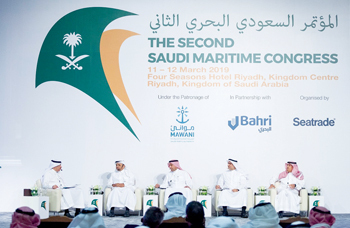 “The congress highlights major projects and strategic opportunities that will solidify the kingdom’s position as a global maritime and logistics hub, and will undoubtedly further our aim of attracting strategic investments and viable ventures into Saudi Arabia by highlighting our objectives over the short, medium and long terms,” he added. “In fact, the country is on an aggressive diversification path, with substantial government spending expected to catalyse Vision 2030 goals and drive sustainable growth and development,” she said. One of the largest projects recently undertaken in the sector is the King Salman International Complex for Maritime Industries and Services, a joint venture of Saudi Aramco, Bahri (National Shipping Company of Saudi Arabia), Hyundai Heavy Industries, and Lamprell. A report published in 2018 by leading Saudi investment bank, Jadwa Investments, said completion of the complex was expected 2022. According to Saudi Aramco, the entire project is designed to contribute around SR64 billion ($17 billion) to the kingdom’s GDP, boost import substitution for maritime products and services by around SR45 billion ($11.99 billion), and create more than 80,000 direct and indirect jobs by 2030.